Just to let you know I have updated my Folksy shop with some new pieces, they are all ready and in stock to buy in Pounds Sterling! 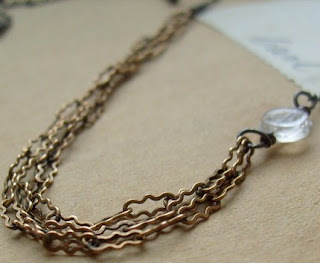 New listings include my new Lemon Balm Earrings and new signature piece – Wave Necklace. During our visit to Jimmy’s farm just after the New Year we popped into their butchers, they are famous for their rare breed Essex pigs. I’ve been hearing lots about cheaper cuts of meat such as oxtail, pork hock and pork belly (don’t worry this isn’t going to be a post about the ‘credit crunch’ or whatever else you would have heard it called recently) so we came back with some wonderful pork belly and also some ‘Suffolk Farmhouse’ sausages. The pork belly was a very reasonable £3 for 2 large slices, probably about 400g. The pork noodle recipe is taken in part from Jamie Olivers cookbook, Jamie at Home, which was a much awaited Christmas present. We are planning on getting stuck in to some proper vegetable growing in the summer and it has some great tips. This recipe requires wonderful long slow cooking of the pork belly in a spicy marinade, so the otherwise tough cut of meat tenderies and becomes melt in the mouth and very aromatic. Whizz up the marinade ingredients in a food processor, pour over the pork, make sure it is thoroughly covered. If the mixture seems a little thick or dry, add a little bit of water. Put into a low oven (gas mark 3) for 1 hour and 30 mins. When the pork is ready, heat up some sunflower or vegetable oil in a wok and cook the noodles. Fry the pork and the marinade in the wok until the pork is crispy on the outside. Then add the noodles, coriander and mix well. Serve with spring onions on top and lime wedges on the side! Poor birdy, originally uploaded by lazygiraffe. We’ve had a bit of a freeze this week, I don’t want to call it a big freeze really because British weather is really quite tame compared to other countries. But its been very January like, plenty of ice, a bit of snow and today lots and lots of fog. I’ve been watching the birds hopping about outside my office window looking quite chilly. I’m not much of a bird watcher but its been nice to see them going about their way. So far we’ve had the obligatory blackbirds, a robin, wrens and best of all, a woodpecker! I’m hoping I see it again on a day that I have a camera. 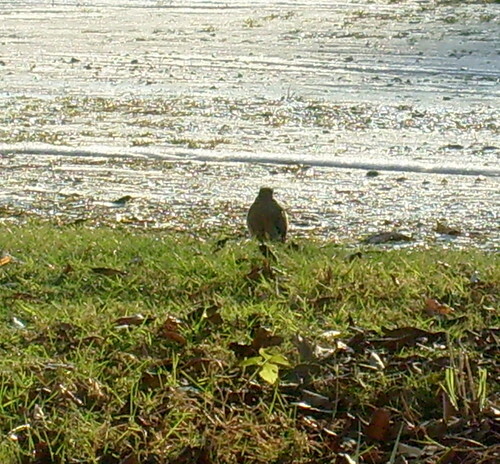 For now, here is a picture of the robin (I think) looking chilly. Double choc chip cookies, originally uploaded by lazygiraffe. I am not responsible for any diets broken by this blog post. Today I made double chocolate chip cookies, I have recently managed to perfect making brownies, after several failed attempts in the past, so I have been a bit brownie made recently and fancied a change. I know these are still chocolate but cookies are something quite different 🙂 They are much better with tea (or milk of course) too. These are adapted from a Nigella Lawson recipe (I can’t bear Nigella Lawson herself but she does have some great recipes) which was really really heavy on the chocolate. I admit to having to tone it down a little bit – for the sake of my health and the fact that I didn’t have 500g of chocolate, which is what the recipe required. Instead I used 100g of chocolate and about 75g for the chips. I used chopped up dark chocolate rather than cooking chocolate chips as I prefer to use proper chocolate. 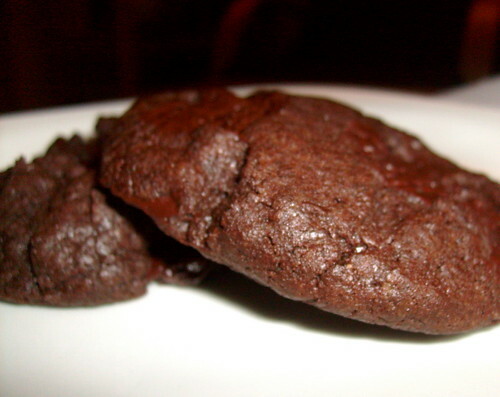 These are great soft cookies and they are so chocolatey but not too cakey and bakey so they aren’t too dense. These are the best ones I’ve ever made. The only problem with these is that you have to wait at least 5 or 10 mins for them to crisp up a bit and the chocolate to set before stuffing your face. If you have broken your diet with these, you probably won’t care anyway because they are too good. First ring, originally uploaded by lazygiraffe. I made my first ring this week! I have been wanting to make rings for the shop and I couldn’t wait to try them out once I got my ring mandrel. 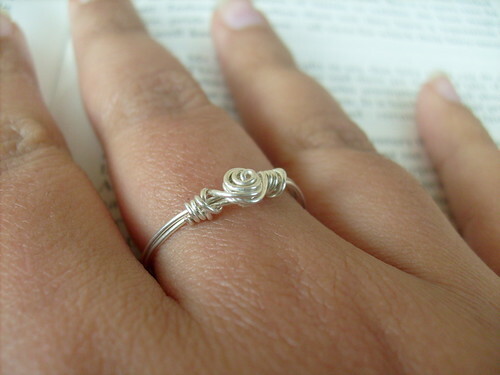 This one is from a tutorial on MacFarland Designs blog (where she also has lots of other tutorials, I am trying out earwires next) for a simple rosette ring. This was also spurred on by the loss of one of my rings down the floorboards the other day (I am cursing the landlords inability to lay them without 1cm gaps). I am hoping to introduce some simple beaded wire wrap rings to the shop, made with vintage beads and different kinds of wire. I think copper would be lovely.